I’m not sure when Trump did me in this month. Was it the visit to St. Louis where he blatantly lied about the tax bill, telling gullible citizens how it didn’t benefit him personally at all? Or, was it the Muslim hate videos he retweeted? What surely got me, though, was the Christmas card business. If you were paying any attention at all, the man spent the whole month on a relentless crusade (allusion intended) to remind everyone “Season’s Greetings” or “Happy Holidays” was somehow sacrilegious. The drummer boy never missed an opportunity to remind anyone and everyone (especially at the Roy Moore endorsement rally in Pensacola) that proper respect must be paid to the Christian holiday in our Christian nation with the intonation of those two words. And, don’t tell me the heavy-handedness was comparable to anything. The most browbeating time of the year? I’m glad they weren’t the only one’s who saw the harping as that insidious. Our tweet tied the audacity of the Christmas card with Trump’s call out of the anti-Muslim videos. The impact of the iconography at this time of year was unmistakable. And, how much separation is there really between Trump’s rhetoric and a live offensive? 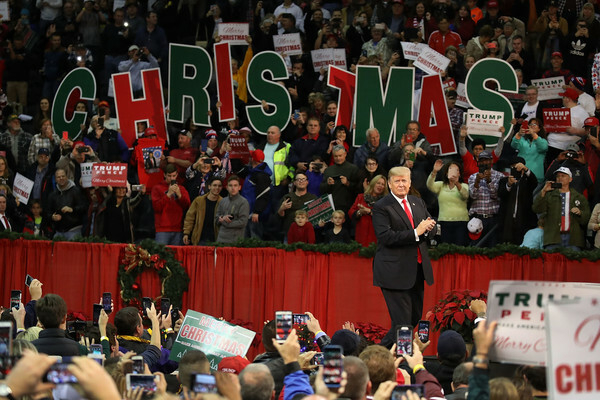 Perhaps the best and the last word on the subject, though, was offered up in this BBC video, titled: “Should Americans say Merry Christmas or Happy Holidays?” It also contains the requisite editing sequence showing Trump mouthing his Christmas rant over and over. After looking into it, what the Brits reveal about Trump’s campaign is that Americans generally feel, to each his own. The video adds that only 55% of Americans will even celebrate Christmas anyway.